Aspergers | Sing. Dream. Hope. Pray. Why, as a society, have we deviated so far from this mindset? We push our kids into a tiny, constrained box, and expect them to behave accordingly. (And that box continually gets smaller and smaller.) Subsequently, when our children don’t conform to society’s perception of a “good” child, we slap labels on them. And why? Is it because we’d rather parent and educate automatons as opposed to vibrant, precocious, inquisitive and curious little beings that take energy, time and effort? That’s a rhetorical question, folks, but one we seriously need to consider. As the parent of both a 32 year old and five year old, I say this with authority and from a VERY unique perspective. Bear in mind, I say this as the parent of a child who definitely has all the classic characteristics associated with high-functioning Aspergers. BUT, I’ve encountered more than a few medical professionals who recklessly want to add additional letters to his diagnosis. I also see so many other kids who are simply playful, curious, active, etc., who clearly don’t deserve to be alphabet soup children. I want to shout, “THEY’RE JUST KIDS, for Pete’s sake! LET THEM BE KIDS!” We need to take charge and advocate for them. We really do. We are THE VOICE for our littles. Certainly not the schools. Not the doctors. Not the busy bodies in the grocery store. We, the parents, are their voice. This entry was posted in Autism, Education, Family, Parenthood and tagged ASD, Aspergers, autism, children, developmental delays, family, parenthood, parenting, play, school, SID, SPD, special needs on March 12, 2014 by Bobbie DuBose. 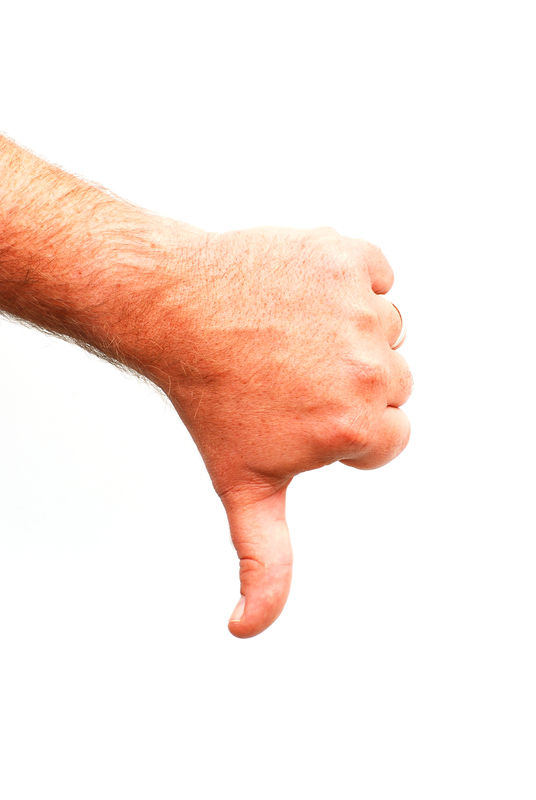 per·sev·er·ate – To repeat a word, gesture, or act insistently or redundantly. I’m just spit balling here, but I don’t think the teacher’s note was written in a favorable tone. And please understand, I don’t think Jackson’s teacher is being overtly critical or mean spirited when she pens notes such as this. (This wasn’t the first time.) But I’ve got to tell you, I also do not instinctively see a negative when I see a note such as this—probably to his teacher’s disappointment. My mind (blessedly) isn’t wired for that. As challenging as Jackson can be at times, I’m grateful I can see his light shining through. Additionally, I’m able to remind myself of his difficult origins. If it sounds as if I’m trivializing matters, please know I’m not. And I’m also not saying I don’t sometimes lose my cool. I do. (See previous post from 1/23/2014 titled “Fail.”) But I also know I drive myself most crazy when I let people of “authority” into my head. That’s when I start to panic over Jackson’s “differences” and challenges. It’s when we receive back-to-back reports of “defiance” and meltdowns that I literally go into overdrive researching autism spectrum disorder (“ASD”), Asperger’s Syndrome and sensory processing disorder (“SPD”). With a clear head, at least for this moment, let me tell you what I really see when I read a notation such as the one mentioned above. When I read the word “perseverate,” I see perseverance—a noun meaning steadfastness in doing something despite difficulty or delay in achieving success. When I see the word “date,” I think of doing an activity with someone you might have a relationship with. And as for the words “mom and dad,” well those are a given. And they’re really special, considering Jackson’s origins as an orphan who spent his first five months of life in an orphanage in Ethiopia. Truly. Special. I’m beyond humbled with gratitude over the titles “mom” and “dad.” It’s one I sport proudly and don’t take lightly. Sometimes it’s all about perspective. The definition of which is: The capacity to view things in their true relations or relative importance. Thinking back to that same day, and the expectancy of a date night with Greg, Jackson and our dogs and some Chick-fil-A at the dog park? I confess. I perseverated too. That’s the truth. It’s the absolute truth. This entry was posted in Adoption, Autism, Education, Family, Parenthood and tagged adoption, ASD, Aspergers, autism, blessings, children, Dogs, education, family, parenthood, parenting, privilege, school, special needs on March 7, 2014 by Bobbie DuBose. For the past few weeks, I’ve been mulling over a post about our family’s newest hobby. 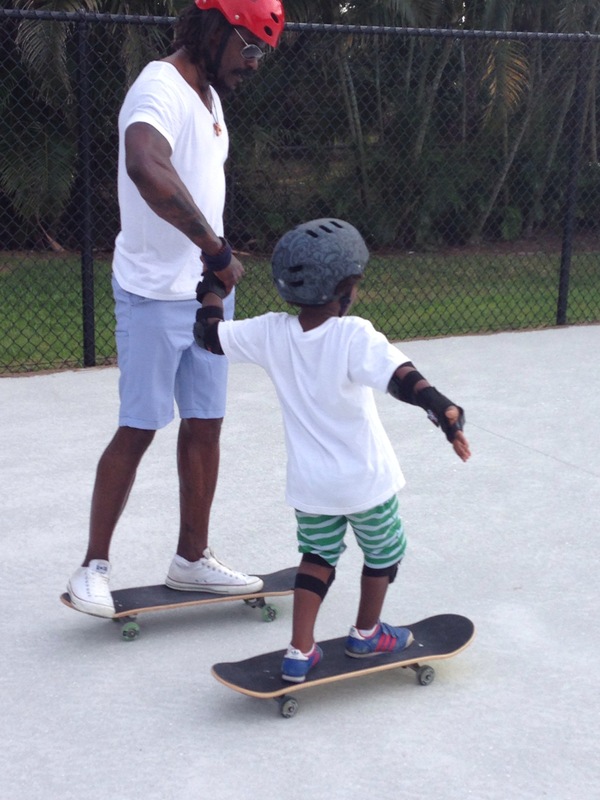 At the tender young ages of 45 and 49 respectively, my husband and I have taken up skateboarding. I don’t mean tooling around, meandering the neighborhood, while taking in the sights. We’re hanging with the big dogs at our local skate parks. No. We’re not crazy. This came about because of the importance we place on family time. Jackson loves to ride his scooter, and he’s very good at it. He’s agile. He’s graceful. And he’s FAST. When Jackson scoots around the neighborhood, safety dictates that I run in tandem with him so I can monitor driveway traffic. This means I’m sprinting for one to three miles at a given time. 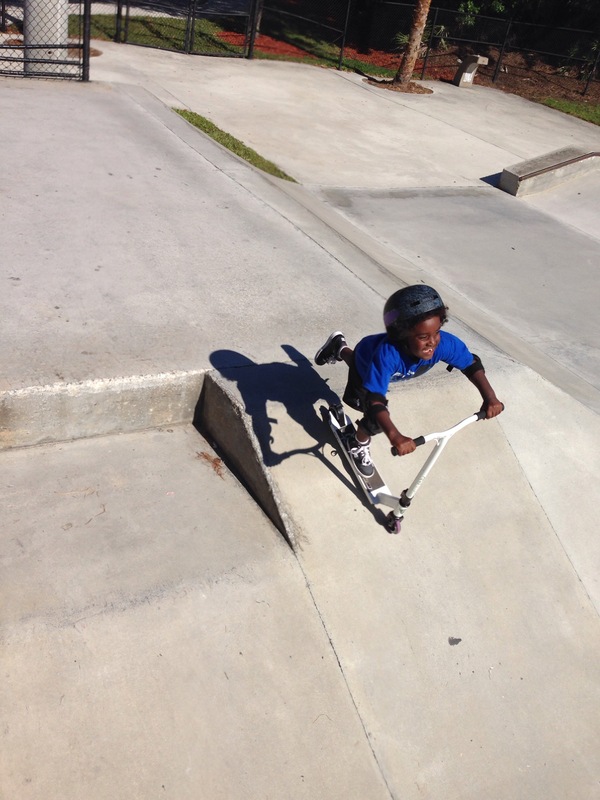 One recent Sunday afternoon, we took Jackson to the skate park simply as an outlet for him. My husband and I decided to give it a try too, so we could make the outings truly about family. We’ve been hooked ever since. Jackson and dad, learning the ropes. I had so many amusing things to say in my originally intended post. I was going to speak about the fact that I skate with orthotics in my Vans and use an SPF of 50 religiously. I was going to talk about the fact that it takes a good 15 minutes to get the joints, tendons and bones adequately lubed in my feet and ankles. And I was also going to mention how tolerant and even accepting most of the young whippersnappers are. Aside from a few occasionally potty-mouthed teens (which are dutifully kept in check by fearless skate park manager Michelle), we’ve not had a bad experience. Until today, that is. Going down (and stimming all the way). As is with most Sunday afternoons as of late, we went to our local skate park following church. Our friend, Paul, joined us. The four of us were having a great time. We skated and scooted hard, working up a sweat. We were all attempting new things and chatting up the really young kids who are beyond encouraging. Jackson was doing his thing, going up and down hills and riding his scooter around the park. I was standing on top of a hill with my new “friend,” Sam, when a young boy ascended the ramp and stopped in front me. The boy was around eight or so. He mumbled something to me but I didn’t understand what he said. I asked him to repeat himself, which he did. He said, “Make him stop.” I asked, “Make him stop what?” He said, “Skating. He’s creeping me out.” I was utterly taken aback, but replied, “No. He’s just scooting.” He said, “No. He’s not,” and skated away. I knew exactly what he was referring to. Sam, also around 8, overheard the conversation and asked me what the boy was talking about. I simply explained that Jackson sometimes makes noises. I loved Sam’s muttered reply to the already-gone boy, “Get over it.” I wasn’t completely surprised this happened. I expected it. Someday. Nonetheless, I wasn’t prepared for it. You see, Jackson verbally self stimulates. [http://www.autism.com/index.php/symptoms_self-stim] He makes sounds. All. Day. Long. Seriously. He’s done it for years and rarely stops, if ever. I took Jackson to the skate park on a school holiday this past week. I chose not to skate with him, as we were running some errands afterward. As I watched Jackson from the observation deck, I heard him clearly. He was uttering endless variations of completely nonsensical words and sounds. I could see some of the older children looking at him with curiosity. It was in watching the kids’ reactions that I knew someone someday would say something. I just didn’t think it would happen so soon. He’s only five. Five! For Pete’s sake, Jackson’s only five. My initial gut reaction (which I DID NOT act upon) was to say, YOU creep ME out, you little brat.” THANK YOU, LORD, for reigning in my tongue. You can come at me all day long; just don’t you dare come at those I love. I will defend my brood to the end. I promise you that. I’m profoundly sad about today’s event. I get a lump in my throat every time I call it to memory. I’m not sad for myself, mind you. I’m sad for Jackson and the unkind people he will encounter throughout his life. He has such tenderness about him. Heck. This is the boy that asks every single person who falls at the skate park (and there are many), “Are you okay?” He’s kind. He’s considerate. He’s loving. He’s trusting. And people are going to break his heart and crush his spirit. That’s the nature of us human beings. As a whole, we don’t tolerate different no matter the age. The mere thought of this shatters my heart. 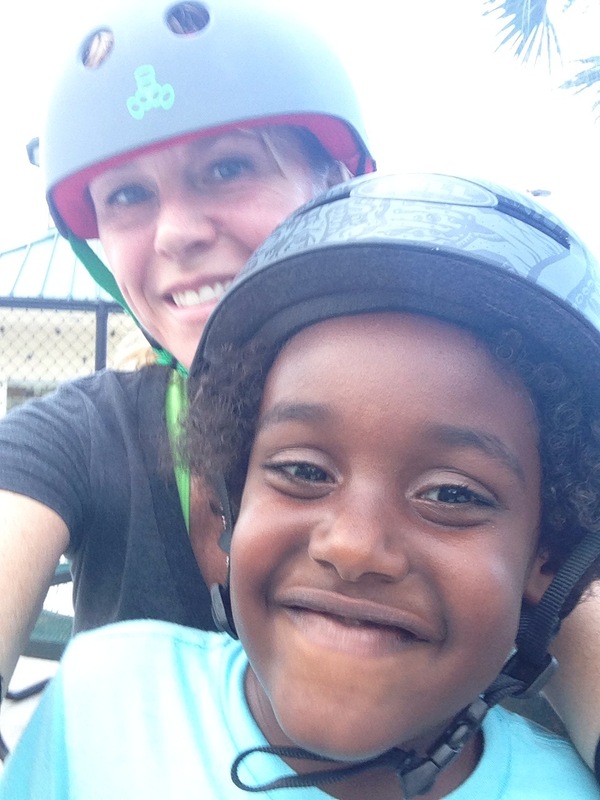 This entry was posted in Autism, Family, Parenthood and tagged ASD, Aspergers, autism, children, family, parenthood, parenting, scooter, scooting, sensory, sensory overload, skate park, skateboarding, skating on February 23, 2014 by Bobbie DuBose. When I bestride him, I soar, I am a hawk. He trots the air; the earth sings when he touches it; the basest horn of his hoof is more musical than the pipe of Hermes. 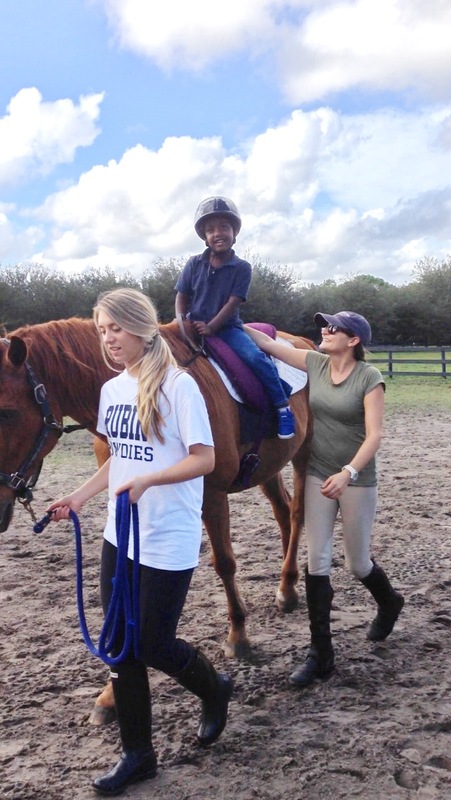 Several months ago, I enrolled Jackson in an equine therapy program at Hopes, Dreams and Horses (“HDH”) of Jupiter Farms. Prior to our initial consultation, I completed an extensive enrollment packet detailing Jackson’s diagnosis, abilities, restrictions and our goals. Our first meeting was with Sue Copeland, Home Dreams and Horses’ Executive Director, and Program Director/equine therapist Carly Brown. Ms. Brown immediately engaged Jackson in conversation. We were given a tour of the facility and had a chance to meet the horses used in the program, as well as boarders. Ms. Brown listened to my concerns attentively and assured me she would meet Jackson on his level, while working with him at his own pace and point of comfort. I’m beyond pleased to say, this is precisely what she has done over the past several months. Initially, Jackson was extremely apprehensive. He had been around horses before, however, he had never ridden one. Instead, he was content to merely stand in close proximity, petting or grooming them—the bigger, the better. 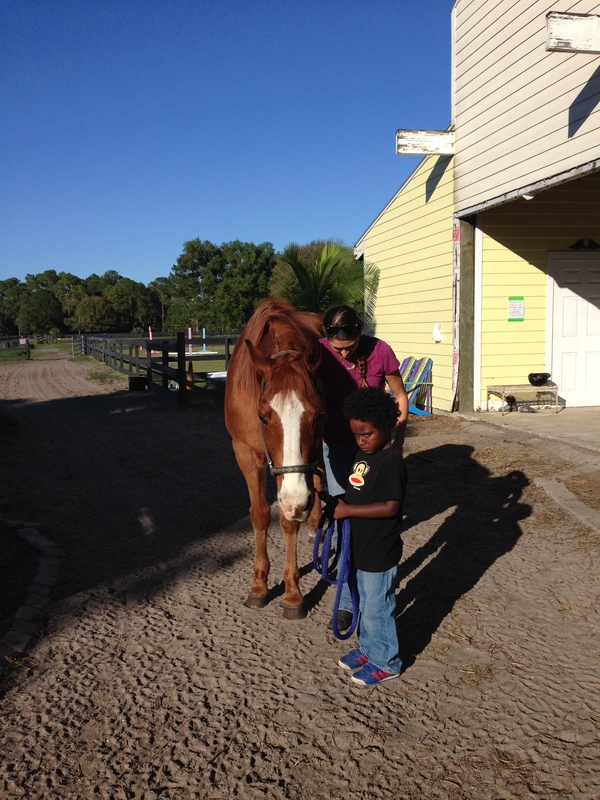 He spent the first few sessions at HDH on the ground, talking to, petting and grooming whichever horse Ms. Brown selected for the session. To be honest, I wasn’t certain Jackson would ever be agreeable to sitting astride a horse. His sensory issues can be extremely overwhelming and limiting at times, which makes for a very stubborn and unyielding child. There is no amount of coercing, bribery or cajoling that will call Jackson to action when he is uncomfortable or unfamiliar with a situation. I will never forget the joy I felt when Jackson first mounted Bruno. As nervous as I was, it brought tears to my eyes. 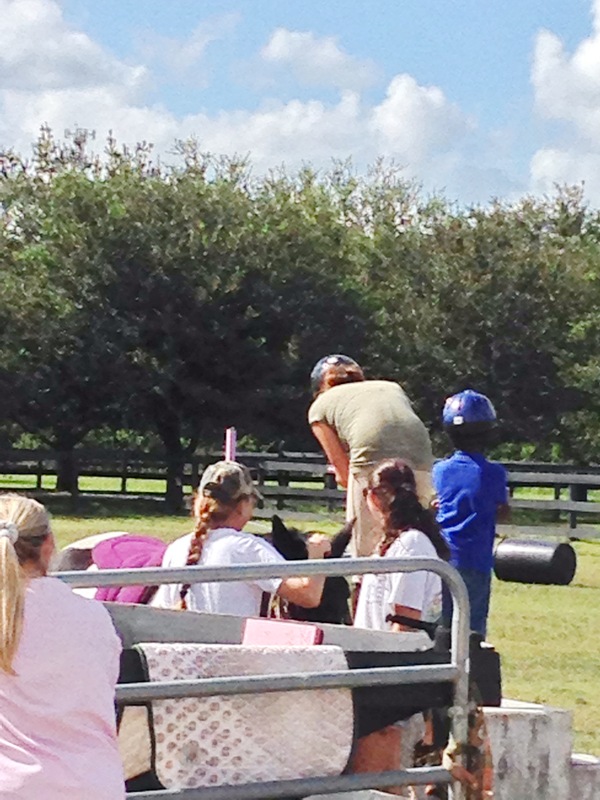 When I tell people Jackson participates in an equine therapy program, they presume he is taking riding lessons. 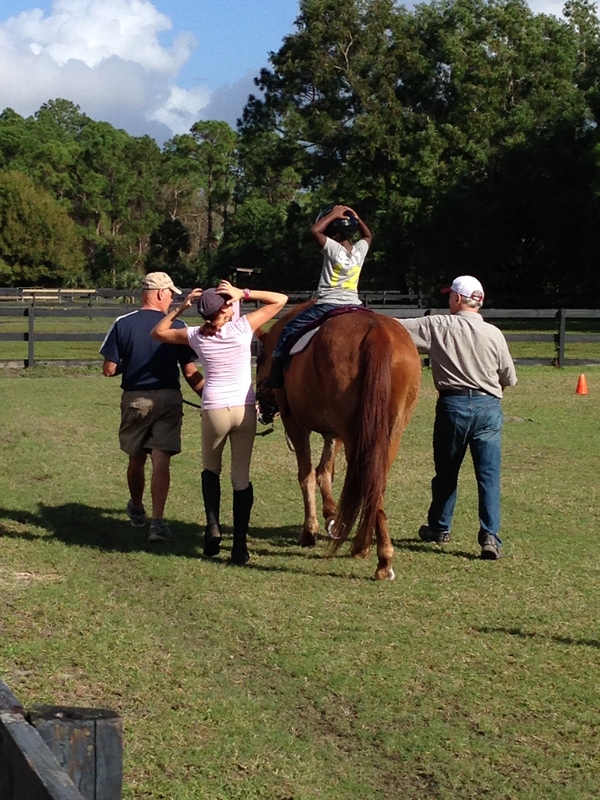 I cannot, nor will I, classify what he is doing as simply a riding lesson. 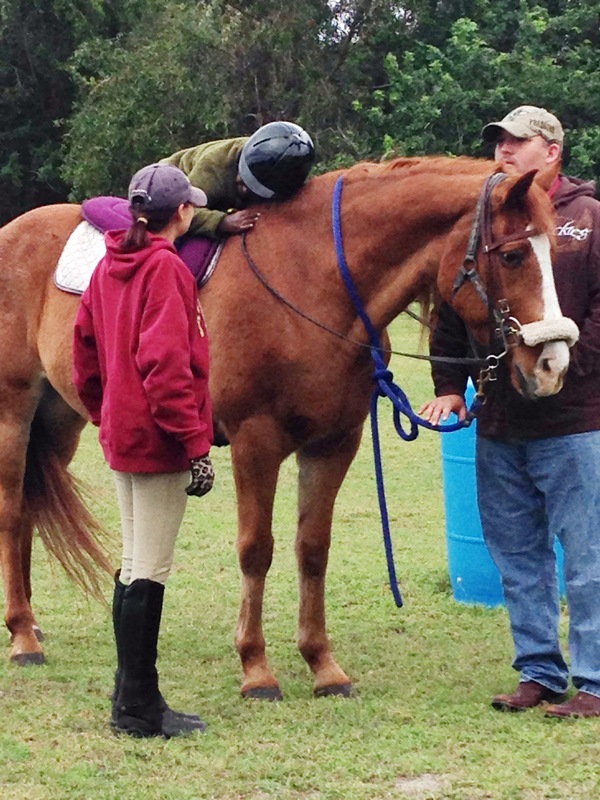 That would do a great disservice to the Hopes, Dreams and Horses equine therapy program. What happens in these twice-weekly 30-minutes sessions is so much more. God bless, Ms. Brown. Seriously. That girl has the patience of Job. She and the volunteers are, as are all good therapists worth their salt, exceptional human beings. Ms. Brown cares deeply about her clients and the program’s horses, so much so that I can’t tell you which she holds in higher regard. That’s really saying something about folks with a true footing in the equine world. Every single second at the stable and on horseback is an intense lesson for Jackson. Truth be told, I think Jackson may have a minor glitch in his short-term memory. This being said, each session requires much repetition. Every action has meaning. From hand, reign and body placement, to mounting the horse, to participating in the “scavenger hunt” type sessions, nuance matters. Think about it. How DO YOU maneuver a 1,200 pound horse alongside an arena rail, close enough to grab an item from a bucket affixed to the rail or post? That takes thought and requires delicate finessing of the animal. Riding requires so many subtle body movements, something that is challenging for someone who lacks intuition and has difficulty with fine motor skills. Throw joint laxity and sensory integration/processing challenges into the mix and you can imagine how patient, tender and encouraging Ms. Brown and her staff must be. Perhaps one day Jackson will have that beautiful fluidity many riders exhibit atop their mounts. In the meantime he has much work ahead of him. I’m grateful that he’s having fun while he works so hard though. And I find those 60 minutes we’re at HDH to be perhaps the most peaceful 60 minutes of my week. Jackson and Blaze. Unadulterated love. 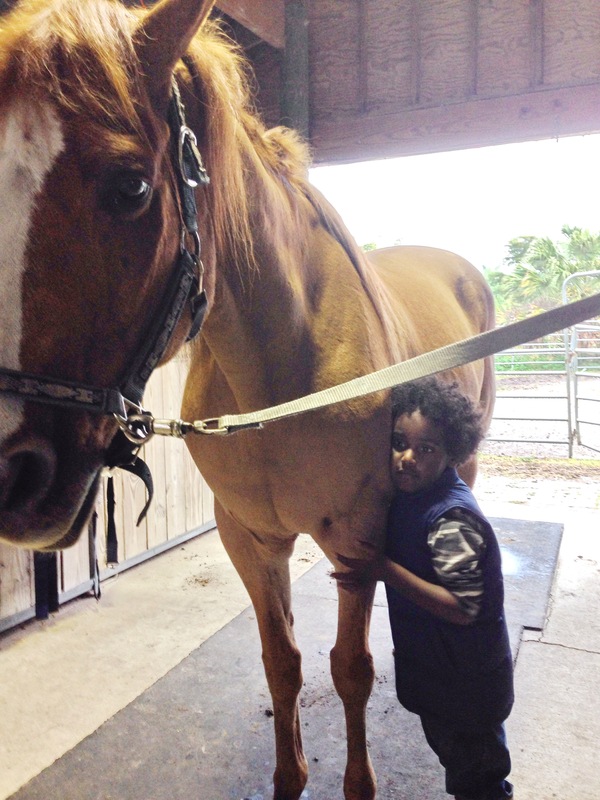 This entry was posted in Autism, Education, Family, Parenthood and tagged Animals, ASD, Aspergers, autism, developmental delays, education, equine, equine therapy, fine motor, horse, sensory, SID, SPD, special needs, Therapy on February 16, 2014 by Bobbie DuBose. This photo is an accurate portrayal of the love our son has for our dog, Geoffrey—a rescue from Ruff World Animal Adoptions in Central Florida. He is the fourth canine family member (and third rescue) we’ve been blessed to share life with in the past twelve years. Our dogs—the last two (Felix and now Geoffrey) in particular—have been vital to our family. They have proven to be effective touchstones for our son—having a somewhat grounding influence on him. For me they have proven to be great stress reducers. My favorite part of the day is lying in bed at night waiting for munchkin to fall asleep. Geoffrey snoozes with his front and back legs draped over me while his head rests in my lap. The room is dark except for the soft glow of a nightlight. As I stroke the side of his face and run his velvety ear repeatedly through my fingers I can literally feel the stress of the day wash away. (Studies have shown that petting a dog can lower your heart rate.) Truth be told, if it weren’t for my husband waiting for me to spend some time with him, I could conceivably stay there all night for the inner peace I’m afforded in that sacred space. If you are contemplating bringing a canine family member into your home I urge you to please consider adopting from a rescue or shelter. There are so many wonderful, loving dogs in desperate need of a loving forever home. An estimated 2.7 million healthy shelter pets are not adopted each year, and only about 30 percent of pets in homes come from shelters and rescues. 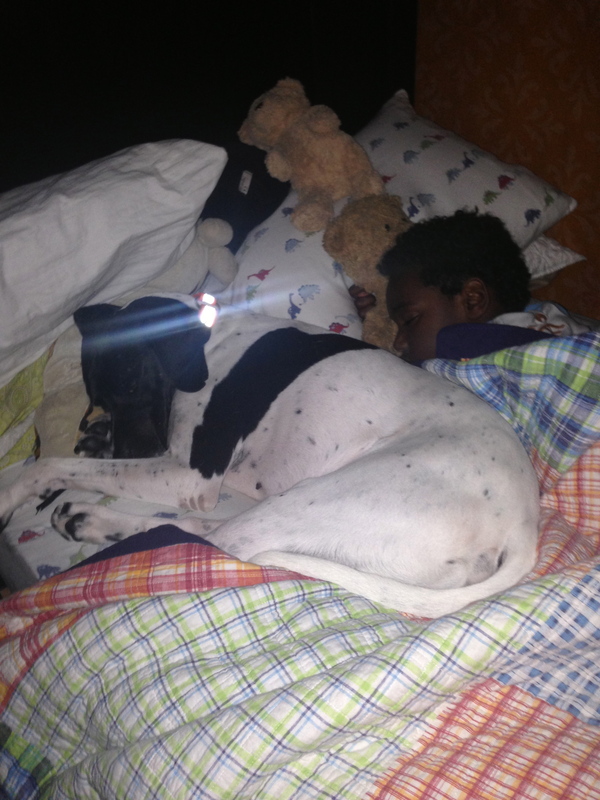 This entry was posted in Uncategorized and tagged adoption, Animals, ASD, Aspergers, autism, Dogs, Health, Rescue, Shelter, Stress on October 12, 2013 by Bobbie DuBose.